In this video, you'll program the object that the player is looking for to appear in only one location. To start, choose what your sprite is looking for. Click the object sprite, then go to the Costumes tab. There are a few different choices available. Choose one of these items or add a different object from the Costume library. What might your character need to find? Once you've chosen an object, click Looks, and drag out Show and Hide Blocks. The Show block should run when the backdrop changes. Click Events, and drag out a When Backdrop Switches block. Click the dropdown and select the name of the location where your object will appear. 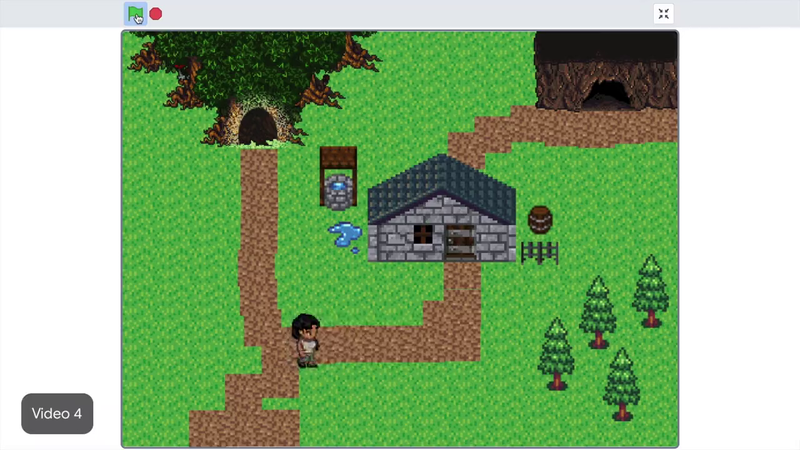 This example uses the cave, but you will choose your own location for the object in your game. Then, drag another When Backdrop Switches block onto the Hide block and select Town. Move the sprite to the location you just selected. Next, program a winning condition that will happen if the player sprite touches the object. Place a Forever loop and an if statement under the Show block. Add a Touching block from Sensing and select Character from the dropdown. You might play a sound or use a Say block to say, "Yay! You win!" Select the object sprite and a costume from the Costumes tab. Show the object in one location using When Backdrop Switches and Show blocks. Hide the object at the start of the program using When Backdrop Switches and Hide blocks. Program a winning condition using Touching, Forever, and If blocks. In the next video, you'll add more storytelling elements to make your game more exciting. Show the object in one location using "when backdrop switches" and "show" blocks. Hide the object at the start of the program using "when backdrop switches" and "hide" blocks. Program a winning condition using "touching," "forever," and "if" blocks.